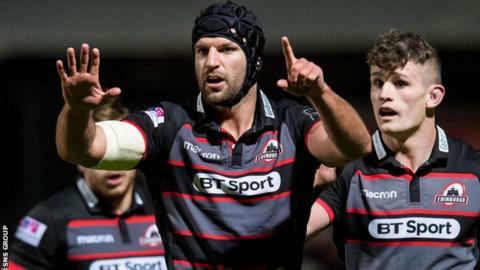 Magnus Bradbury has been stripped of the Edinburgh captaincy following an internal investigation into an off-field incident. The Scotland back-row, 22, missed the recent European Challenge Cup win over London Irish with a head injury suffered during a fall on a night out. Fraser McKenzie will replace Bradbury as captain until the end of the season. "I'm not going to accept that behaviour away from the field," said head coach Richard Cockerill. "The players are very aware of what I expect from them. They're adults and they have to make the right decisions." Bradbury's head knock will result in him missing Saturday's Pro14 visit to Italy to face Benetton, but he will be available for the following week's match against Ospreys at Myreside. "I'm sure everyone has been there at some point when they wake up on a Sunday morning regretting what they've done on a Saturday night. That's part of growing up," Cockerill said. "Magnus is no longer the captain of the team and that's his sanction for not being able to manage his behaviour away from the field. "They know how to behave and if they choose to behave outside of that, then clearly I have to manage it." Cockerill would not be drawn on the ongoing internal investigation concerning another Scotland international, flanker John Hardie. Scottish Rugby announced on Friday that the New Zealand-born back-row was subject to an internal disciplinary investigation and the BBC has since learned it is in relation to alleged cocaine use. "I have a view on it, but at this point, it's not appropriate that I talk about it," Cockerill continued. "I'd like all the players available to play, but that's not how it is. We get on with the playing parts and try to leave this distraction aside. "Of course it's a distraction because two of our guys are unavailable to play, so we'd all like them to be available to play, but they're not. "Guys have stepped up and thankfully we've performed reasonably well, so other people will get their opportunities. Like anything else, life will go on." The former Leicester Tigers coach admits he wants to instil higher professional standards at a club that has perhaps fallen short in that regard in recent years. "I need guys to be honest if they've done something wrong and we can deal with that, but people have to be accountable for what they do and take responsibility. Simple as that," he said. "That's how the environment will be run. That's just normal for me. If it hasn't been run like that previously then I can't comment on that. "If guys don't want to be part of what we're doing, and a lot of people have said to me that the Edinburgh environment is a little bit loose, I don't want that to affect what happens on the field, but we also have a responsibility away from the field."